In this Nov. 3, 2015 file photo, the Keystone Steele City pumping station is seen in Steele City, Neb. 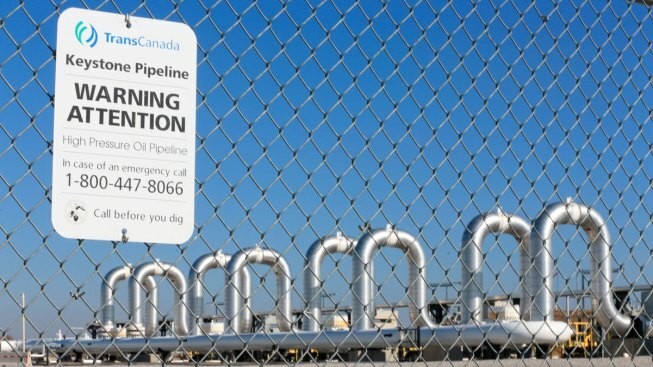 Part of the controversial Keystone Pipeline was shut down Thursday after more than 200,000 gallons of oil leaked in South Dakota, the state and the company that runs the pipeline said Thursday. Brian Walsh, an environmental scientist for the Ground Water Quality Program of the state Department of Environment and Natural Resources, told NBC News that TransCanada, the Calgary-based company that operates the Canada-to-Texas line, reported the leak Thursday morning in a sparsely populated area of Marshall County, near Amherst in the northeastern part of the state. The leak comes four days before Nebraska officials are scheduled to vote on whether to approve a 275-mile-long extension of the project through the state.